Michigan State University Extension educator Frank Cox is one of Muskegon County’s “40 Under 40.” The Muskegon Chronicle’s 40 Under 40 list looks at 40 young individuals who are poised to potentially become the county’s future leaders, and movers and shakers. Frank’s work for MSU Extension involves career exploration, work force preparation and financial literacy. He’s also a member of the National Association of Extension 4-H Agents and Epsilon Sigma Phi. Many of us had parents or other adults in our lives who made a difference. We had someone we could count on for wise advice and a listening ear – maybe an older sibling, a teacher or a 4-H leader. Often kids may be searching for guidance and support but they lack strong role models. That’s where 4-H Youth Mentoring comes in. The program matches caring individuals with young people to provide support, friendship, reinforcement and constructive examples. 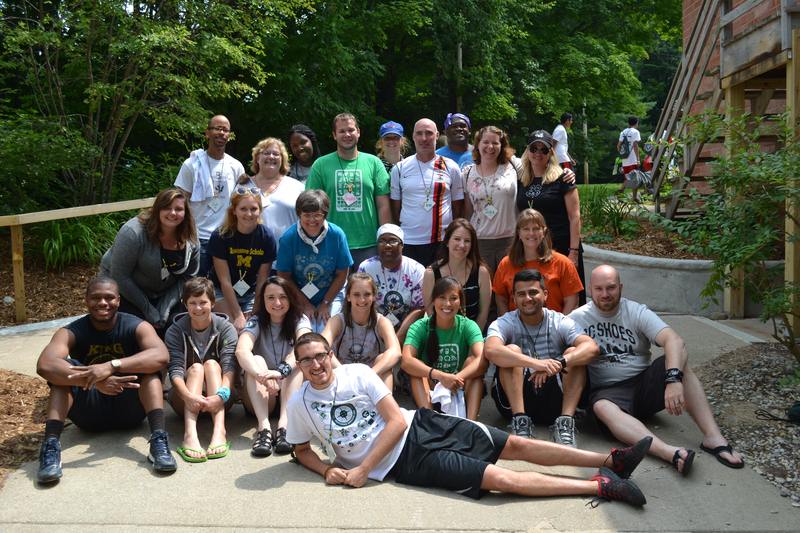 For the sixth year, an event took place that helps to strengthen the youth mentoring community across Michigan. 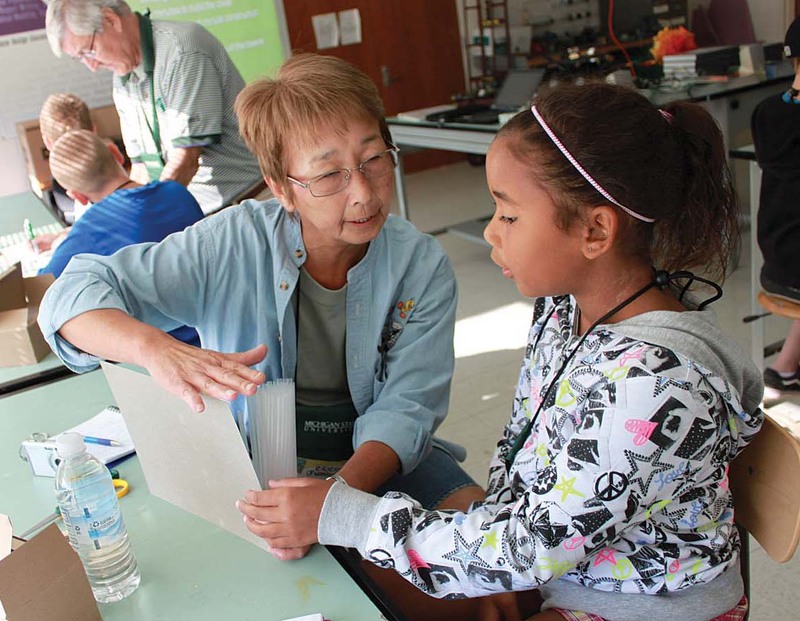 More than 90 participants congregated at Kettunen Center in Tustin July 19‒21 to take part in 4-H Mentoring Weekend. Michigan State University Extension 4-H mentoring educator Scott Lakin and Extension program instructor Dequindre Bell co-chaired the event under the leadership of campus staff Lisa Bottomley, senior Extension specialist, and Molly Frendo, associate program leader. 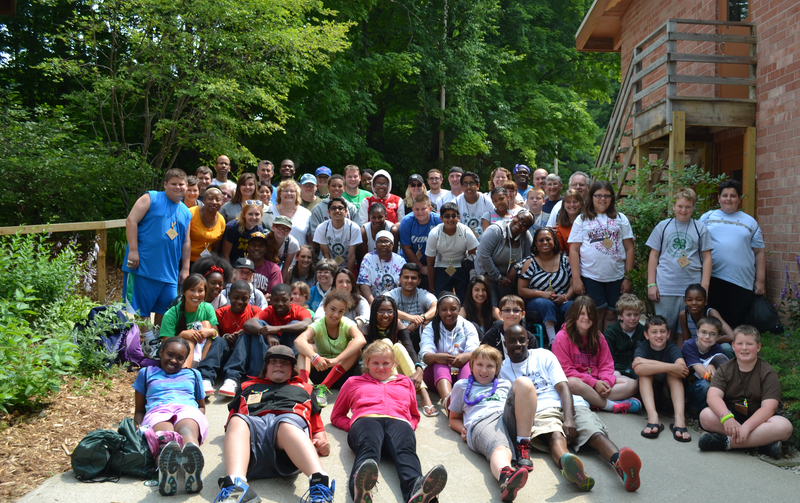 In addition, participants explored conservation education, science literacy, service learning and healthy living. Mentoring partners strengthened their relationships through fun and interactive activities both indoors and outdoors, taking advantage of Kettunen Center’s beautiful setting on Center Lake. Other Extension staff members who helped out with the event included Danielle Abrams, Kea Boyd, Barb Brow, Jessica Cotton, Lizz Duran, Susan Fenton, Derrick Harrison, Lisa Kelley, Jennifer Lasslett, Aaron Lawrence, Kim Lewis, Anetria Rhodes, B’Onko Sadler, Edward Scott, Katie Sosin, Barb Steele and Scott Victor. Besides the learning and the fun, 4-H Mentoring Weekend provides both mentors and mentored youth with a community of peers who share their experiences. Find photos of the event on Michigan 4-H Youth Mentoring’s Facebook page at https://www.facebook.com/michigan4hyouthmentoring. Michigan State University Extension 4-H staff members and volunteers, please encourage outstanding 4-H’ers ages 14 to 19 to attend the 2012 National 4-H Congress. This leadership, citizenship and community-service event takes place Nov. 23–27 at the Hyatt Regency in Atlanta, Ga. I’ve been serving on the governing committee for this event and know it’s a great opportunity, and I’ve heard many participants state that it is the highlight of all of their experiences in 4-H. Although this might seem relevant only to Children and Youth Institute staff, I’d encourage anyone who knows an older 4-H youth who would benefit from this experience to call it to their attention. Young people from across the U.S. will come together to attend workshops about leadership development, character education, agriculture, cultural awareness and diversity education, workforce preparation, environmental stewardship, science and technology literacy, and communication-skills development. Participants will take part in an international dinner and dance, and visit the Atlanta History Center. They may choose to tour Centennial Olympic Park, the Georgia Aquarium, CNN, the Carter Presidential Library and the Martin Luther King Center. The congress features some of the nation’s most outstanding community leaders, speakers and educators. Betsy Knox, Extension program leader, is the overall event coordinator. Extension educator Frank Cox serves as onsite coordinator, and Extension educator Roxanne Turner serves as onsite chaperone. The cost is $1,175 per participant. This covers the delegate’s round-trip airfare to Atlanta, registration fee, lodging, meals, a shirt and a group photo. Delegates will also want to bring about $100 for luggage fees, meals to and from Atlanta, and souvenirs. County 4-H staff members must send a County Reservation and Deposit Form to the event’s logistics coordinator Priscilla Martin by July 18 to let her know the number of delegate reservations she’ll need to save. Contact Priscilla at 517-432-7635 or pjmartin@msu.edu for a form or retrieve it from the ANR SharePoint site under “MSUE,” “Preparing Michigan’s Children and Youth,” “Leadership/Civic Engagement,” then “Documents” and finally “National 4-H Congress.” You’ll find the form in both Word and PDF format. For more information, contact Priscilla. On the eve of our annual feast, I am reminded of the close connection between this holiday and 4-H. One of the capstone events available through 4-H is the National 4-H Congress, and it begins on the Friday after Thanksgiving and ends on the following Tuesday. National 4-H Congress used to be held in Chicago, and although I wasn’t in Michigan at that time, I can imagine that quite a few Michigan 4-H youth participated in that event. Today’s National 4-H Congress has changed considerably. It has moved south, presented in Atlanta, Georgia, each year instead of Chicago. And the event has taken a turn towards service, recognizing youth for their service in 4-H, and then reinforcing that with speakers and events that give great examples of others who have served their clubs, their communities, their country or their world. Eighteen 4-H youth from Lapeer, Shiawassee, Ingham, Monroe, Hillsdale, Branch, Menominee, Marquette and St. Joseph counties will represent Michigan, this year. They will be joined by Pat Waugh, Michigan State University Extension 4-H youth educator from Lapeer County, and Frank Cox, 4-H youth educator from Muskegon County, as leaders and chaperones. Chelsea Carl, 4-H youth from Branch County, was selected from a national application pool to serve on the 2012 National 4-H Congress Youth Leadership Team. I serve on the Board of Directors for National 4-H Congress and will join the group in Atlanta early next week in time for the board meeting, which follows the closing of the event. Monday is the highlight of the event from my perspective. That is the day when all of the youth, gathered from across the nation, go into the schools and neighborhoods of Atlanta to carry out service projects. Youth also raise funds to help pay for the construction of a new home through Habitat for Humanity. So as many of us are tempted to sleep in on Friday morning (or go shopping), keep in mind those youth from Michigan and elsewhere who will be heading out for Atlanta. The connection between 4-H and Thanksgiving reminded me of a story I posted just a few weeks ago about a youth from Kent County, Nate Seese, whose service is the subject of a video contributed as part of the 4-H Revolution of Responsibility campaign. Nate tells the story of deciding to donate the meat from livestock he raised as part of his 4-H project to a local food bank to help ensure that families facing budget challenges would still have access to protein in their diets. Nate’s desire and commitment to give is inspiring for all of us. And as is so often the case, his generosity draws out generosity from others – the bidders at the 4-H auction agree to make the livestock available for the food bank, a local meat locker agreed to donate their butchering and preparation services, and the food bank volunteers help to distribute the meat. National 4-H Council hosted Cooperative Extension directors and administrators from across the country at a luncheon in San Francisco recently, a part of the program at the Association of Public and Land-grant Universities (APLU) Convention. During the luncheon, Andy Ferrin, senior vice president and chief marketing officer at National 4-H Council, showed Nate’s video to the entire group gathered for lunch. I was humbled to see Nate’s story told again – humbled by his generosity and inspired by his leadership. Ultimately, the Thanksgiving holiday is a holiday that reminds us that we depend on others around us in so many ways. Those who grow crops and livestock, those who get food to the store or market where we buy it, those who help us understand how to prepare food safely, and on and on. The best way to express thanks is to give. And Nate reminded me of that with his story. Enjoy this unique and special holiday as many 4-H youth will in Atlanta this weekend – by giving to others.